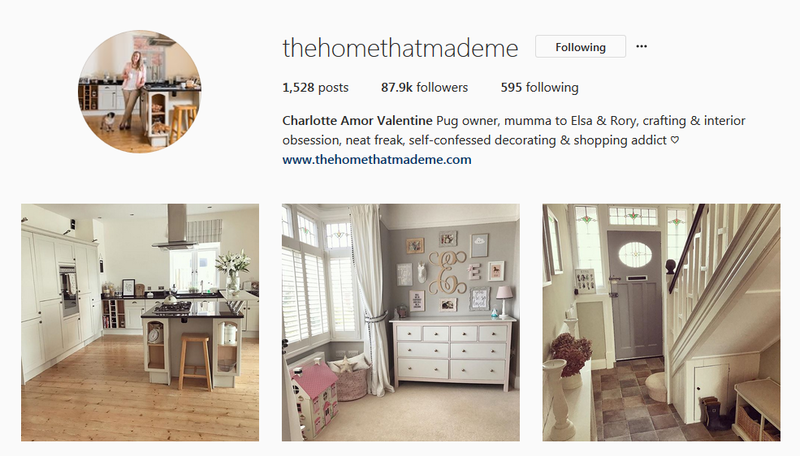 Back in 2014 Charlotte (@thehomethatmademe) was one of the very first people I started following when I moved back to East Anglia and started using Instagram. Well, I say started using Instagram, prior to then there had been a couple of photos of my new pjs, my meals and cringeworthy selfies! I want to say ‘I liked Charlotte before she was popular’, like a prize hipster, but the truth is she has always been popular and with very good reason. One of my favourite features – the initial pictures. People often ask me where I bought them from but no, I made them! Following Charlotte’s wonderful tutorial. What I didn’t expect to happen was to make friends, and to get to know the people behind the pictures. Charlotte, along with others, took me under her wing and made me feel a part of the community. Because that’s what Instagram is, it’s a community. Sometimes, as with the ‘real world’ people aren’t quite as nice as you’d hope but we are here to support each other and again, with Charlotte, I feel like I could talk to her about something that was bothering me and she would be helpful and supportive. Just this week she cheered me up when I was feeling a little down about my Instagram. One of my favourite things about Charlotte is that she is a person, not an account. I have followed people in the past who don’t give much away about themselves, don’t engage with followers and although they might have beautiful homes full of inspiration I have unfollowed them as I don’t feel I’ve got to know much about them. Charlotte is completely different, and that’s not to say she doesn’t have an amazing house because it’s absolutely beautiful, but she’s also so kind, funny and obviously a great mum. She engages with followers and responds to queries with a smile, even though I’m sure she’s been asked some of them 100s of times by now! That’s what makes a good Instagrammer. So basically what I want to say is thank you to Charlotte for being a great Instagrammer (and of course blogger) and an inspirational interior bod, but above all a lovely person and friend. If in the unlikely event you don’t already follow Charlotte, here’s the link, you’re welcome!